"It's chaotic, but always planned - I feel like, right now, Simone is a busy person." On Saturday one of the world's pre-eminent sports stars will take to the floor at The O2 in London and the British audience would do well to appreciate Simone Biles, who this week admitted retirement plans are in the offing. If Biles' gold-medal winning performances of the last few years are anything to go by it should be quite a watch. It is fitting that Biles will bring the curtain up - she is the biggest name in world gymnastics, is the sport's major transcendent athlete and, like any global superstar, there has been a crossover to the non-sporting world of celebrity - a fourth-placed finish on Dancing with the Stars will do that for you. "I don't like dancing in front of people! You don't take the ballroom to the gym floor and you don't take the gym floor to the ballroom," she laughs infectiously in an exclusive interview with Sky Sports. "Every single show was scarier than the Olympics, it was terrifying it was all live, not recorded. "As a gymnast we do routines and we learn them for so long before we compete, but on Dancing with the Stars we only had a couple of days to learn them and then perform them. People think gymnasts have an advantage, but it's ballroom dancing, it's all so different." There was also method to the disco-ball, sequinned madness of 2017 - it came a matter of months after the performances at the Rio Olympics that catapulted Biles to super-stardom. "After the Olympics your body takes its toll on you, I had to take a physical and mental break from the sport," she added. "I had a lot of obligations and with all the asks of us it would have been too hectic to try and go back to training. I think I might have burnt out." It was not just celebrity dance competitions that Biles got to enjoy, having been wrapped up in gymnastics all her life. A post-Rio break, in her own words, gave her the chance 'to be a normal kid for once' - if some of the pursuits can be labelled 'normal'. "Before I couldn't really go on family vacations, there were so many things that I couldn't do, like indoor skydiving and swimming with sharks and then going to the movies and eating whatever I wanted!" It is worth remembering that Biles, with 25 Olympic and World Championship medals, and contemplating retirement, is just 22-years-old, so that opening quote: "It's chaotic, but always planned - I feel like right now Simone is a busy person," is fitting. "After the year off, I felt like I had never been in better shape in my life - the year helped me physically and mentally." Biles' journey began at the 2013 World Championships in Antwerp, where, alongside a love of Belgian stroopwaffles, she claimed the first of 14 World Championship gold medals. "I was so young and it was my first big assignment, I had no real pressure, Marta (Karolyi - her coach) just told me to go out there and to make a name for myself. "A lot of those I competed with then are now in college gymnastics, competing and getting ready to graduate." Biles hopes her and her USA team-mates' courage to speak out against sexual abuse will help others avoid feeling alone. In January 2018, Larry Nassar, Team USA's doctor for 18 years, was sentenced to up to 175 years in jail after he was reported by more than 150 women for sexual abuse. 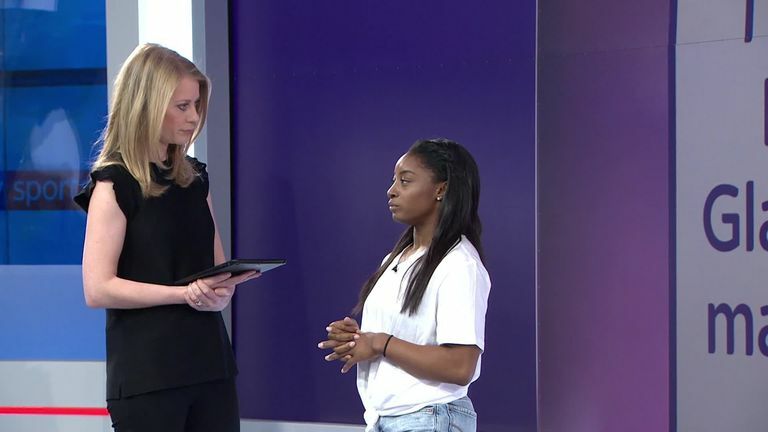 Biles was one of his victims and, having tweeted about her assault, she spoke openly on Sky Sports News' Sportswomen show earlier this week. "I think the huge athlete I am and the following that we have, social media gives us a platform to speak out on those times. "Hopefully it will reach out to other kids and adults and have an impact and make them them feel like they are not in it alone." "I had never been to the Olympics, the Worlds had always been my goal, but the Olympics then became the pinnacle," she says. "I feel like Rio was a dream come true. From when you are a little kid you think of these times and then it happens and it's surreal - I felt like a princess and it felt like a fairytale. "A lot of it was actually a blur which is the craziest part as you only get to relive some of those memories then from videos. You don't get to cherish the moment even though you try to as much as you can - most of it doesn't sound like real life." Alongside Gabby Douglas, Laurie Hernandez, Madison Kocian and Aly Raisman the 'Final Five' became something of a phenomenon as they took gold in the team event. Biles added three more golds of her own, but what was her most memorable moment? "The team competition, when we won the first gold - that is when we realised we were Olympians," Biles says with her unmissable smile. Personal success followed in the all-around, the floor and the vault - and with it the honour of being voted by her fellow Team USA athletes to carry the flag at the closing ceremony. "As soon as the score came up I could see my parents crying, and then I asked my coach because I couldn't see the board - everyone was screaming and cheering and I was waiting to see the board. "I remember when they told me [I was to carry the flag] I was in shock - I asked 'are you sure its me?'. And then I was nervous that I might not be able to hold it because I saw how big it was and I had seen Michael [Phelps] with it. "I started stressing about not getting it right as I know our flag is not allowed to touch the floor." Phelps' Olympic record is not in jeopardy with Biles already planning to retire post 2020, but that does not mean targets are not still in mind. Biles' mother nicknamed her 'My Little Turtle' and she now collects the figures - the obvious analogy is not lost on her. 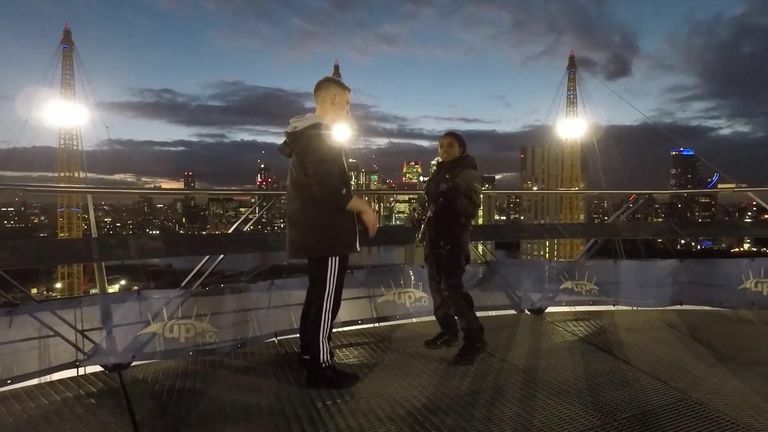 Biles and Max Whitlock climbed to the top of London's O2 ahead of their appearance at the Superstars of Gymnastics. "I still have goals - and even though I am on the older side of the US team, I feel like I have plenty more to give. "Usually you peak when you are 16/17 years old - but with an average age of 19 we had the most successful US team of all-time so hopefully we are changing that." "The first step will be to make the team, I feel like that will be a huge honour, as for Tokyo only four get to represent the USA. "It always seems like everyone else sets them [goals] for me so I try and keep personal goals to myself and keep them for before I go into competition - so I don't disappoint myself or anybody. "It is every athlete's goal to go and represent your country and it's unreal to me that the greatest athletes from every country are there with the same goal." Watch Superstars of Gymnastics on Saturday at 12.30pm and 6.30pm, live on Sky Sports Mix. WATCH: Whitlock, Biles on top of O2!